Egypt’s Nour El Tayeb, one of the most amazing athletes in squash, heads up a world-class draw, featuring seven of the world’s top 10 female players, in the forthcoming Manchester Open. This PSA World Tour Silver event takes place between May 9-13. 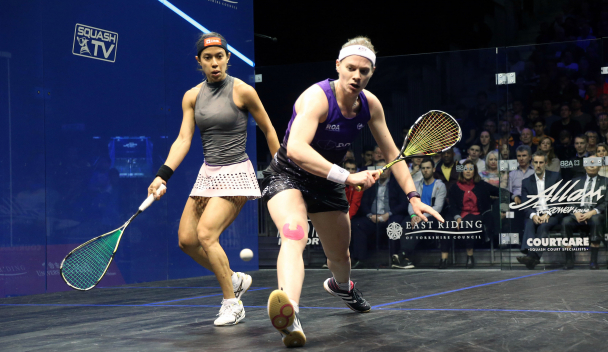 The Manchester Open, a women’s-only tournament, will see players compete for the inaugural trophy and a $76,000 prize fund at Manchester’s National Squash Centre. The Cairo-based World No.3 El Tayeb, runner-up in this season’s PSA World Championship, headlines the draw ahead of New Zealand’s World No.5 and 2018 Commonwealth Games Gold medallist Joelle King, England’s No.1 Sarah-Jane Perry and fellow Egyptian Nouran Gohar. Live coverage of the entire tournament will be shown on SQUASHTV (rest of world), the PSA World Tour Facebook page (excluding Europe and Japan) and Eurosport Player (Europe only), while the semi-finals and final will also be shown live on mainstream broadcasters around the world such as BT Sport, Fox Sports Australia, Astro and more. PSA Women’s $76,000 Manchester Open, National Squash Centre, Manchester, England.